As of spring 2017, the Duke Superfund Research Center has been renewed for an additional five-year grant cycle. The new center will support five research projects as well as six outreach and training programs/cores. The focus of the center will remain on exploring early life exposure to toxic chemicals that affect development and cause later life consequences. Dr. Richard Di Giulio will continue to serve as the center’s director and Dr. Heather Stapleton will act as deputy director. Read more here. On Tuesday, November 29, 2016, Dr. Nishad Jayasundara delivered the Wetterhahn Award Lecture at the National Institute of Environmental Health Sciences. 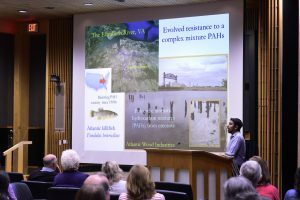 Jayasundara, a Postdoctoral Research Associate in Dr. Richard Di Giulio’s lab at the Duke Superfund Research Center, presented about his research on the effects of polycyclic aromatic hydrocarbons (PAHs) on the development of Fundulus heteroclitus. 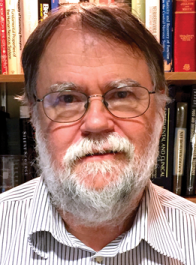 He received the Karen Wetterhahn Memorial Award from NIEHS in 2015. Read more here. The August 2016 issue of Toxicological Sciences featured the work of Dr. Joel Meyer, co-investigator on Project 3 at the Duke SRC, on its cover. The paper outlines the work that Dr. Meyer and his team have done to illuminate the mechanisms of arsenic toxicity in mitochondria. The image shared on the cover illustrates the mitochondrial membrane potential in the pharyngeal bulb of C. elegans, the versatile nematode that the lab uses in much of their research. See the full August issue here. 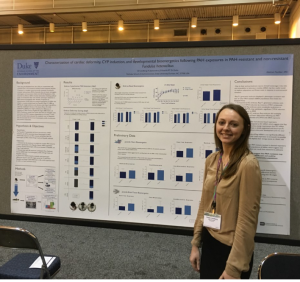 The Duke University Superfund Research Center had a strong presence at this year’s Society of Toxicology (SOT) 55th Annual Meeting and ToxExpo, held in New Orleans, LA, on March 13-17, 2016. The labs of Dr. Richard Di Giulio, Dr. Theodore Slotkin and Dr. Frederic Seidler, Dr. Joel Meyer, Dr. Heather Stapleton, Dr. Edward Levin, Dr. David Hinton, and Dr. Lee Ferguson were among those represented. For more details, see the full post here. Congratulations to Nishad, who received the Wetterhahn Award during the Superfund Research Program Annual Meeting in Puerto Rico in November, 2015. The award recognizes an outstanding SRP graduate student or postdoctoral researcher who exemplifies certain qualities of scientific excellence. Nishad is a post-doctoral researcher in the Di Giulio Laboratory. You can read the full press release here. Our symposium this past November had a record number of participants in attendance to hear our speakers discuss The Toxicity of Power. To learn more about what was covered during the symposium, please read the NIEHS article here. Join us for the Fall ITEHP Symposium on Friday, November 13, 2015. This symposium titled, The Toxicity of Power, brings together scientists, students, regulators and the concerned public to highlight specific toxicological problems from a range of energy producing activities and to discuss ways in which these problems can be minimized. On April 23rd, 2015, Dr. Joel Meyer (Project 3) and Gretchen Kroeger (Research Translation Core) took a quick trip down to CDC’s campus outside of Atlanta to visit with folks from the Agency for Toxic Substances and Disease Registry (ATSDR). Dr. Meyer, whose research at Duke University focuses on the role of mitochondria as a target of toxicity for a variety of contaminants, gave a presentation highlighting Duke SRC work with PAHs along Virginia’s Elizabeth River, covering mitochondrial DNA damage, and the later life effects of environmental exposures. After the presentation, Dr. Meyer and Ms. Kroeger met with several groups of ATSDR scientists to discuss their research and community-engaged work with exposed populations. Meyer and Kroeger returned to Duke with a better understanding of the great work being done at ATSDR, as well as an assortment of research ideas, connections, and hope for future collaborations with the Agency. The Duke SRC would like to join SOT in recognizing the amazing research and training Dr. Slotkin has brought to both Duke University and field of toxicology. Dr. Slotkin has served as the Duke Integrated Toxicology and Environmental Health Program’s Director of Graduate Studies and taught every single one of the ITEHP students for the 30+ years of the program’s existence. Thank you so much for your tireless contribution and dedication to toxicology and our trainees! Click here to read the SOT announcement. 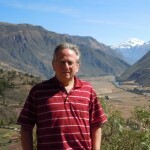 Dr. Joel Meyer Goes to Oman! This past December, Dr. Joel Meyer took a trip to Oman as an invited speaker at the Arab-American Frontiers of Sciences, Engineering, and Medicine Symposium. Meyer’s talk, Can Environmental Exposures that Damage Mitochondria Contribute to Cancer?, was part of a larger session “Environmental Regulators of Cancer.” Meyer’s abstract is included below. Cancer treatment is expensive, and sometimes ineffective in allowing significant extension of the healthy lifespan. This has motivated studies to understand the causes of cancer, with significant effort focused on genetic investigations. However, studies with twins and other lines of evidence indicate that typically fewer than 30% of cancer can be explained by genetics alone. It is likely that much of the remainder is explained either by environmental exposures, or environmental exposures in the context of specific genetic backgrounds (“gene-environment interactions”). Well-studied mechanisms by which environmental exposures result in cancer include causing DNA damage, eliciting inflammatory responses, and disrupting endocrine function. Mitochondria play a number of roles in our cells, most famously producing energy in the form of ATP and mediating the process of apoptosis, or programmed cell death. Mitochondria also have their own genome, which is much smaller than the nuclear genome but present in very high numbers (104-105) in most cells. Mitochondrial biology is altered significantly in cancer. For example, tumor cells exhibit a high level of mitochondrial DNA mutations, and mitochondrial use of fuel to generate energy is much different in most cancer cells. The relevance to cancer of those changes is not fully understood, and investigating the role of mitochondrial function and dysfunction in cancer is an active area of research. My laboratory focuses on studying the effects of environmental stressors on health. We hypothesize that mitochondria are uniquely vulnerable to exposure to environmental stressors, in particular important pollutants, as has been observed previously for certain drugs (Meyer et al., 2013). This is partly because the fundamental characteristics of mitochondria facilitate the accumulation of specific pollutants, based on their chemical properties. Once there, chemicals can cause toxicity in a variety of ways including inhibiting the energy-producing electron transport chain and damaging lipids or mitochondrial DNA. Interestingly, while there are a large number of copies of mitochondrial DNA in each cell, several DNA repair pathways that function in the nucleus are absent from mitochondria. In particular, nucleotide excision repair (NER) is not present in mitochondria. This is important because this DNA repair pathway is exceptionally versatile, capable of detecting and removing damage caused by a very wide range of common and important environmental stressors including ultraviolet radiation, some polycyclic aromatic hydrocarbons (produced by the burning of organic materials, including fossil fuels), mycotoxins such as aflatoxin B1, and others. In the final portion of the presentation, I will discuss what the field has learned about how mitochondria are affected by environmental toxicants, and consider the possibility that environmental stressors that target mitochondrial components might contribute to cancer? Now Accepting Summer 2015 Internship Applications! If you’re interested in gaining laboratory experience, interacting with our PIs and Trainees, and meeting like-minded students from across the country, consider applying for one of our summer internships. Applications are due February 4, 2015. Please visit our Training Opportunities page for more information about projects accepting interns. Jordan Kozal, a Superfund trainee (Di Giulio laboratory) and PhD student in the Integrated Toxicology and Environmental Health Program, was awarded Best Student Poster Presentation at this year’s SETAC annual meeting which took place Nov. 9-13th in Vancouver, Canada. Jordan’s poster focused on her research on PAH cardiotoxicity in Elizabeth River, VA killifish. 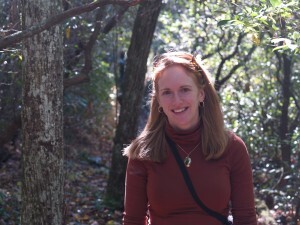 On October 27, 2014, PI Heather Stapleton presented at the UN Environment Program’s Persistent Organic Pollutant Review Committee’s annual meeting in Rome, Italy. She provided scientific testimony on the debromination of decaBDE, a flame retardant chemical used in electronics and textiles. Debromination of decaBDE to lower-brominated congeners increases the compound’s risks to the environment and human health. The committee subsequently approved a risk profile for decaBDE and plans to draft a risk management evaluation. The draft risk profile is available for download here. Laura Macaualay awarded the Otto Hutzinger Student Award at the International Dioxin Conference! 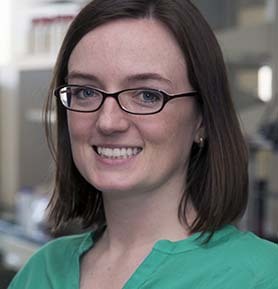 Laura Macaulay, a Superfund trainee and PhD student in the Integrated Toxicology Program, was awarded the Otto Hutzinger Student Award for the Best Presentation at this year’s International Dioxin Conference in Madrid. At the conference, Laura presented on her Superfund research focused on early life exposure to 6-OH-BDE-47, a polybrominated diphenyl ether or PBDE, and developmental effects mediated by the thyroid hormone receptor. Interested in science? Come work in our labs this summer! We currently have spots for full-time summer interns in the fields of biology, chemistry, psychology, neuroscience, engineering, and environmental sciences. There are also opportunities to be involved in the Center’s research translation and community outreach efforts. Please click the link below to open the document containing the descriptions for each of the opportunities. The deadline for applications is March 3rd, 2014. Audrey Bone receives K.C. Donnelly Externship Award! Audrey Bone, graduate student in Dr. Richard Di Giulio’s lab. 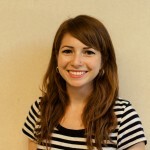 Audrey Bone is a graduate student in Duke University’s toxicology program and is working in Dr. Richard Di Giulio’s lab. Currently, Audrey is working on evaluating the effects of nanomaterial-based degradation on toxicity of polycyclic aromatic hydrocarbons (PAHs) and how the potential degradation products of these processes affect vertebrate development. For her externship, Audrey will be spending six weeks at Oregon State University (which also hosts a Superfund Research Center) where she will be continuing her research under the mentorship of Robert Tanguay, Ph.D. At OSU, she’ll learn to use the zebrafish developmental toxicity bioassay and molecular tools developed at OSU to understand the toxicity pathways and phenotypes associated with these degradation products. Dan Brown, Duke SRC trainee, to give talk during Superfund Research Program webinar series! This webinar series features the outstanding work being conducted by graduate and postdoctoral students conducting SRP-funded research. Specifically, this year’s series consists of presentations from Poster Award Winners from the previous SRP Annual Meeting. The intent of the series is to increase collaboration and exchange of ideas among young investigators conducting SRP-funded research/activities and to hear about their award-winning work. The presentation titles and abstracts are below. The webinar will be held May 30th, 2013 1:00 – 2:00 pm EDT. Please Register via the gotowebinar registration page. Polycyclic aromatic hydrocarbons (PAHs) are important environmental contaminants in many aquatic systems. Acute embryonic exposure to PAHs is known to cause cardiac teratogenesis in fish, and research has shown that early life exposure to some types of hydrocarbons causes heart alterations and decreased swimming capacity in fish. A population of Atlantic killifish inhabits a Superfund site (Atlantic Wood Industries, Norfolk, VA—AW) that is heavily contaminated with a mixture of PAHs from former creosote operations. This population has developed resistance to the acute toxicity and teratogenic effects caused by the chemical mixture in sediment from the site. While studies have examined heart alterations and decreased swimming capacity in fish following exposure to PAHs, little is known about the impacts of more subtle, early life exposures, which are arguably more broadly applicable to environmental contamination scenarios. This study examined the later life consequences of early life exposure to sublethal concentrations of PAH mixtures in both the adapted and unadapted Atlantic killifish. Chronic exposure to inorganic arsenic (InAs) through contaminated drinking water is a major problem worldwide. InAs undergoes hepatic methylation to form mono- (MMA) and di- methyl (DMA) arsenical species thereby facilitating As elimination. Both reactions are catalyzed by arsenic methyltransferase (AS3MT) using S-adenosylmethionine (SAM) as the methyl donor. SAM biosynthesis depends on folate-dependent one-carbon metabolism. The objective of this project was to test the hypothesis that blood SAM is associated with increased As methylation in Bangladeshi adults. Howe additionally wished to test the hypothesis that the associations between SAM and methylated As metabolites are dependent on folate and cobalamin levels. We’re proud to share with you that two of our trainees received awards at the Carolinas SETAC (Society of Environmental Toxicology and Chemistry) in March. Mariah Arnold, PhD candidate in Dr. Richard Di Giulio’s lab, won 3rd place in the Student Platform Presentation for her talk entitled “Selenium toxicity and bioaccumulation in fish associated with mountaintop removal coal mining effluent”. Her talk discussed her research in West Virginia involving the collection of native fish species to look at tissue compartment specific accumulation and speciation of selenium. She also mentioned a biofilm project in which biofilms placed in creeks and rivers in West Virginia are brought back to the lab and fed to fish in order to understand the trophic transfer of selenium and other contaminants of concern. Abstract – Mountaintop removal (MTR) coal mining activities in the Appalachian Coal Region (ACR) of the U.S. has significantly altered water chemistry in streams draining such operations. One of the major contaminants of concern is selenium (Se), a known avian and fish teratogen. Native fish were collected via electroshocking during 4 separate sampling events in April-July, 2011-2012. Collections took place at three sites; from a section of the Mud River, WV that drains the MTR-coal mining impacted main stem (MR7), sites on the un-impacted Left Fork of the Mud River (LFMR) as well as the newly impacted Big Ugly Creek (BU). LFMR and BU creek chub (Semotilus atromaculatus) fillets averaged similar concentrations of Se (2.01±0.3 and 1.68±0.5 mg/kg dw respectively) while MR7 creek chub fillets were significantly higher (6.20±1.4 mg Se/kg dw) (α=0.05 by Student’s t-test). Green sunfish (Lepomis cyanellus) fillets showed a similar pattern of higher Se concentrations in MR7 samples compared to BU and LFMR samples. Ovary and liver tissues from MR7 creek chubs also contained higher levels of Se (8.40-26.17 mg/kg dw) compared to the same tissues in creek chubs from LFMR (4.88-8.56 mg/kg dw). BU fish contained similarly low ovary and liver Se concentrations. Adult female fathead minnows (Pimephales promelas) fed on biofilms grown at sites in MR7 for two weeks contained qualitatively higher Se concentrations in liver and ovary tissues compared to fathead minnows fed on LFMR biofilms. Future experiments will increase limited sample sizes and will be combined with X-ray absorption near edge spectroscopy analysis to better understand how Se speciation changes can impact uptake and bioavailability in impacted aquatic systems. Dan Brown, also a PhD candidate in the Di Giulio lab, won 1st place in the Student Poster Presentations for his poster entitled “Sublethal embryonic exposure to complex PAH mixtures alters later life behavior and swimming performance in Fundulus heteroclitus”. Click below to read Dan’s abstract. Abstract – Polycyclic aromatic hydrocarbons (PAHs) are important environmental contaminants in many aquatic systems. Acute embryonic exposure to PAHs is known to cause cardiac teratogenesis in fish, and research has shown that early life exposure to some types of hydrocarbons causes heart alterations and decreased swimming capacity in fish. A population of Atlantic killifish inhabits a Superfund site (Atlantic Wood Industries, Norfolk, VA—AW) that is heavily contaminated with a mixture of PAHs from former creosote operations. This population has developed resistance to the acute toxicity and teratogenic effects caused by the chemical mixture in sediment from the site. While studies have examined heart alterations and decreased swimming capacity in fish following exposure to PAHs, little is known about the impacts of more subtle, early life exposures, which are arguably more broadly applicable to environmental contamination scenarios. This study examined the later life consequences of early life exposure to sublethal concentrations of PAH mixtures in both the adapted and unadapted Atlantic killifish. Atlantic killifish from King’s Creek (non-polluted reference site) and the AW site were manually spawned and eggs were screened for development at 24 hours post fertilization (hpf). Screened eggs from both populations were then exposed to sublethal dilutions (0.1% and 1.0%) of Elizabeth River sediment extract (ERSE), from the AW site, as determined by dose response studies. Following exposure, embryos were screened for cardiac abnormalities at 144 hpf. Cardiac abnormalities were elevated in the King’s Creek 1.0% exposure, but were not present in the 0.1% exposure. Atlantic Wood fish had no observable cardiac deformities at both the 0.1% and 1.0% exposures. Ten embryos were randomly selected from all treatment groups and preserved for histology. The surviving embryos were returned to the incubator, hatched at day 14 pf, and reared in a flow-through system. Juvenile killifish were evaluated for startle habituation and diving/exploring behavior at 2 months post hatch (ph). King’s Creek killifish exposed to 1.0% ERSE were hyperactive in startle response testing relative to control killifish and demonstrated reduced exploring behavior in the dive test. Following behavioral testing, 5 juveniles were randomly sacrificed from each treatment group for histological assessment. The remaining juveniles were raised to 5 months ph and tested for critical swimming capacity (Ucrit), and dissolved oxygen consumption following 10-minute exercise bouts. P42-ES10356. New Training Opportunities – Deadline extended to April 1st! Interested in gaining some research experience with Duke’s Superfund Center? We have opportunities for you! Through our Research Experience for Undergraduates (REU) Program, you can apply to work with any of our 4 projects and 3 of our cores (Analytical Chemistry Core, Neural and Behavioral Toxicity Assessment Core, and Research Translation Core). Contrary to the name of the program, you don’t need to be an undergraduate student. This opportunity is open to undergraduate and Master’s students. Visit this page to learn more about the research opportunities available and how to apply. The deadline for applications is March 15, April 1st, 2013. You are invited to join us for our spring symposium on the relationship between epigenomics and developmental toxicants. Epigenomics has been defined as “the study of the complete set of epigenetic modifications on the genetic material of a cell” (Wikipedia) and, thus, understanding how those genetic modifications interact with actions of toxic substances on development is critical. The symposium is being held at the Doris Duke Garden Center at Duke University. To register for this free, public event by February 25th, please RSVP by email to eve.marion@duke.edu. You may know that one of the research projects here at Duke deals with flame retardants, but do you know what they’ve been finding? The cover story for the Fall 2012 issue of Dukenvironment focuses on Dr. Heather Stapleton and her research on flame retardants. Read about the work her lab is doing to better understand the dangers of flame retardants in baby products, how flame retardants are (not) regulated, and how flame retardants may affect our health here. The agenda, registration, abstract submission, and travel information can be found here. On July 24th, Dr. Heather Stapleton provided expert testimony before the U.S. Senate Committee on the Environment and Public Works. Dr. Stapleton was part of a larger panel including Hannah Pingree, former Speaker of the Maine House of Representatives; Marshall Moore, Great Lakes Solutions, a Chemtura Business; William Rawson, Latham & Watkins LLP; and Tony Stefani, San Francisco Firefighters Cancer Prevention Foundation. More information on the panel and an archived webcast can be found by clicking here. You can also read Dr. Stapleton’s oral and written testimony. Arysta LifeScience made the decision to halt the manufacture of MIDAS (methyl iodide) in the US. Methyl iodide is commonly used as a pesticide on strawberries. Dr. Ted Slotkin, one of our lead researchers, was involved in this process by providing expert testimony on the health effects of methyl iodide. Read more about the case, Arysta’s decision, and watch Dr. Slotkin’s testimony here. May 17, 2011: CBS News – Hidden dangers in baby products? May 14, 2010: Dr. Slotkin SRP Research Brief: Childhood Exposures to Pesticides May Contribute to Obesity and Diabetes in Adults. Read the research brief here. Dr. Ted Slotkin has submitted comments to a U.S. Environmental Protection Agency’s Scientific Advisory Panel regarding the Agency’s re-evaluation of the toxicity of the pesticide chlorpyrifos. Chlorpyrifos, a neurodevelopmental toxicant, remains one of the most widely used organophosphate pesticides, despite a long history of documented human and ecological risks from exposure through food, drinking water, and residential and occupational applications. Dr. Slotkin’s comments addressed recent epidemiological studies, mechanisms of toxicity, and routes of administration in animal studies. Read more here.